Here is the latest Here And Now Tour and the previous Tours that have continually been a phenomenal success. We are pleased to announce our first ever Here And Now cruise, it will sail The Mediterranean in October. Departing Southampton on the 22nd October 2013 and taking in, El Ferrol, Malaga, Alicante, Barcelona, Gibraltar, Lisbon, before arriving back at Southampton on the 3rd of November 2013. The cruise ship is Oceana, owned by P&O and operated by Carnival. For priority booking please email info@tdpromo.com stating "Priority Booking"
Promoter has the right to change the line up. 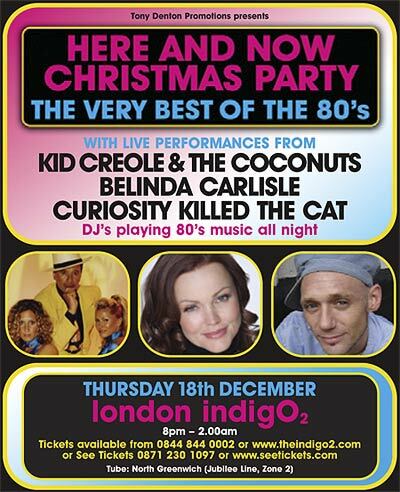 THE GREATEST EIGHTIES PARTY EVER! Tickets may be subject to a booking fee. Promoter has the right to change the line up. DUE TO BOY GEORGE'S CURRENT SENTENCING HE HAS BEEN REPLACED ON THE MAY UK ARENA TOUR WITH RICK ASTLEY. OUR THOUGHTS ARE WITH GEORGE AND HIS FAMILY AT THIS TIME. We regret to announce that the promoter in Ireland, Bravo Group Ltd has cancelled this show, anyone that has purchased tickets should go to the point of purchase for a refund. We have been informed the reason being for the cancellation is another show that they are promoting at the same venue is not selling and they do not have the funds to cover putting on these concerts. DUE TO OVERWHELMING PUBLIC DEMAND ADDITIONAL DATES HAVE BEEN ADDED IN NOTTINGHAM AND GLASGOW. TICKETS ARE OFFICIALLY ON SALE FRIDAY 19TH OCTOBER BUT VISITORS TO THIS SITE WILL BE ABLE TO PURCHASE TICKETS FROM THE VENUE IMMEDIATELY. From the famous Stock, Aitken & Waterman stable where he was discovered as a tea boy. Rick went onto have many hits that included his No. 1 single ‘Never Gonna Give You Up’ (which was also the best selling single of 1987 and won a Brit for Best single the following year), a cover of the classic ballad ‘When I Fall In Love’, ‘Together Forever’, ‘Whenever You Need Somebody’, ‘Take Me To Your Heart’, ‘She Wants To Dance With Me’ and ‘Cry For Help’. No other British solo male can match his 7 consecutive top ten hits in that decade. The girl band of the eighties and one of the most successful girl bands of all time - this sassy duo which comprises of original members Sara Dalin and Keren Woodward take to the stage for their first Here & Now tour. Their many hits include ’Cruel Summer’, ‘Robert De Niro’s Waiting’, ‘Venus’, ‘Love In The First Degree’, ‘I Want You Back’, ‘It Ain’t What You Do It’s The Way That You Do It’, ‘Really Saying Something’, ‘Shy Boy’ and ‘Na Na Hey Hey Hey Kiss Him Goodbye’ amongst many others. The band also featured on the Band Aid single ‘Do They Know It’s Christmas’ (No.1) as well as covering ‘Help’ with French & Saunders for Comic Relief. Most recently seen on ITV1s Hells Kitchen, Paul has a genuine soul voice and hits that have spanned the decades. This former singer with the Q-Tips returns for this tour after appearing on the very first one in 2001 to great critical acclaim. Paul will sing a selection of his hits from ‘Wherever I Lay My Hat’, ‘Love Of The Common People’, ‘Come Back & Stay’ to ‘Everything Must Change’. Featuring the iconic Martin Fry, ABC were one of the bands that defined the decade. With his gold lame suit and suave looks ABC made an impact on our hearts as well as the charts. Their hits include ‘The Look Of Love’, ‘All Of My Heart’, ‘Shoot That Poison Arrow’ all taken from one of the 80s most classic and timeless albums ‘Lexicon Of Love’, other hits include ‘When Smokey Sings’ and ‘How To Be A Zillionaire’. Ben Volpeliere-Pierrot graced the covers of every pop magazine in the country during the late eighties. With their unique brand of cool pop they enjoyed a string of top ten hits that included ‘Down To Earth’, ‘Misfit’ and ‘Hang On In There Baby’ as well as other hits that included ‘Name & Number’ and ‘Ordinary Day’. Formed in 1987, their classic pop hits included the top 5 hit ‘Shattered Dreams’, ‘Me and My Foolish Heart’, ‘I Don’t Want To Be A Hero’, ‘Heart Of Gold’ and ‘Turn Back The Clock’ (which featured Kim Wilde on backing vocals), their album of the same name went to No. 1 and went double platinum in the UK selling over 4 million copies worldwide. This Grammy nominated band fronted by the enigmatic Nick Van Ede are best known for their classic songs ‘(I Just) Died In Your Arms’ (No. 1 in 17 countries selling over 3 million copies) and ‘I’ve Been In Love Before’. On sale Friday 29th February. OR ARCHANT NORFOLK OFFICES at Millennium Plain and Prospect House in Norwich, Church Street Cromer and Regent Street Great Yarmouth (booking fee applies). Show starts: 7pm / Gates open: 4.30pm. OR IN PERSON AT: Portsmouth Guildhall, Chichester, Midhurst and Petworth, Tourist Information Centres and Stansted Park Garden Centre. OR BY POST FROM:UK Productions Ltd, Lime House, 78 Meadrow, Godalming, Surrey GU7 3HT (Cheques payable to UK Productions Ltd with a stamped addressed envelope). Tickets go on sale at 9.00am on Friday 15th February. If you buy a ticket to the concert you get free entry to the Motor Show that day. Children aged 16 and under get free entry (proof of ID may be requested at the gate). Tickets go on sale at 9.00am on Friday 29th February. Tickets maybe subject to booking fee. Price includes 20% discount. Offer ends 30th September. Over 18's only. An extra £10 off per person when booked by 30th September. The offer is subject to limited promotional availability & can be withdrawn at any time. Groups - 10% discount on 10 or more adults booked at one time. These tickets must only be booked via the IML Concerts line 01603 660 444. Groups - 10% discount on 10 or more adults booked at one time. These tickets must only be booked via the IML Concerts line 01603 660 444. One Night. NINE Acts. Non Stop Hits. "Blickling Celebrates the Tenth Anniversary of its Famous Concerts in Style"
...AND THE BIGGEST FIREWORK FINALE EVER! Tickets may be subject to a booking fee. Due to the phenomenal success of the Here And Now tours, we are pleased to announce The Here And Now Christmas Party Tour, sure to be the best Christmas party in town. Seven major stars from the 80’s performing their greatest hits all in one amazing show. The full line up includes THE HUMAN LEAGUE, KIM WILDE, FIVE STAR, ALTERED IMAGES, DOLLAR, THE BELLE STARS & VISAGE. Here and Now 2001 brought together some of the biggest names in the music industry performing their classic hits live on stage. The artist’s songs stretch over two decades and are as fresh today as they were yesterday. The full line up included Paul Young, Kim Wilde, Curiosity Killed The Cat, Nick Heyward, Heaven 17, Go West & T’Pau. All these artists perfomed their greatest hits, no fill ins, just the big hits you want to hear.